Known as the Daughter of the Durbar Hall, Rashtrapati Bhavan's Library’ is located at the north-eastern corner of the Bhavan and is accessed through the North Staircase. “A circle within a square”, it is said to resemble St Stephen’s Walbrook in London. The Rashtrapati Bhavan library, though a square, is given a circular character by the dome above it, which is supported by eight arches. The Library was built to hold book shelves that were sixty feet high and could fit the corners at right angles. The book shelves, that store a collection of 33,000 books, including 2000 rare books, run along the walls of the Library and are not restricted to the corners alone. 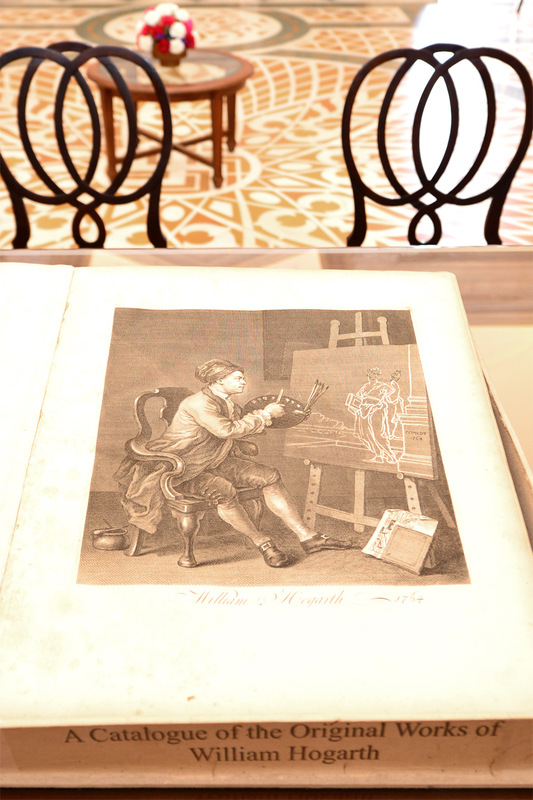 The oldest book of the Library, A Catalogue of the Original Works of William Hogarth was published in the year 1795. The twelve pillars that are embellished with the Delhi Order bells on their top make an inner square. Oil on canvas paintings, ‘The Creation of Man’ and ‘Invention of the Printing Press’, adorned with gold leaf frames are placed above the two fireplaces in the Library. 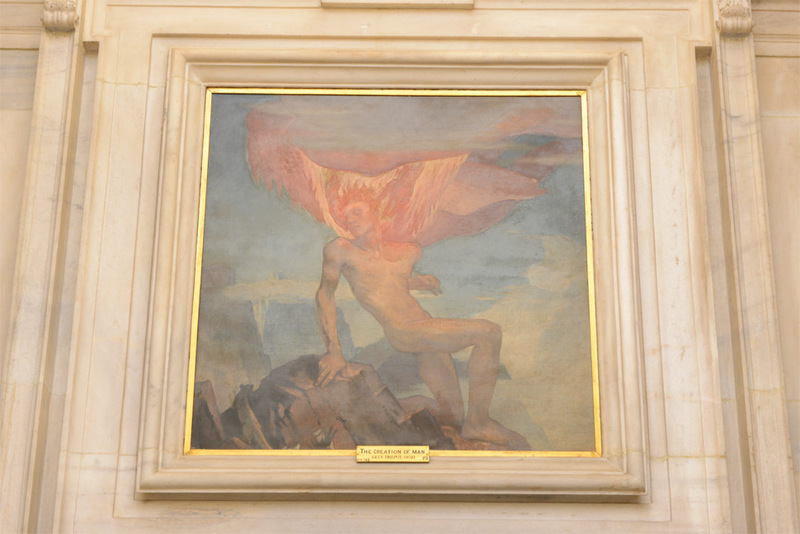 Made by Glyn Philpot, The Creation of Man was commissioned in 1930 due to Lutyens’ desire to have something resemble Michelangelo’s Creation of Adam for the Government House. 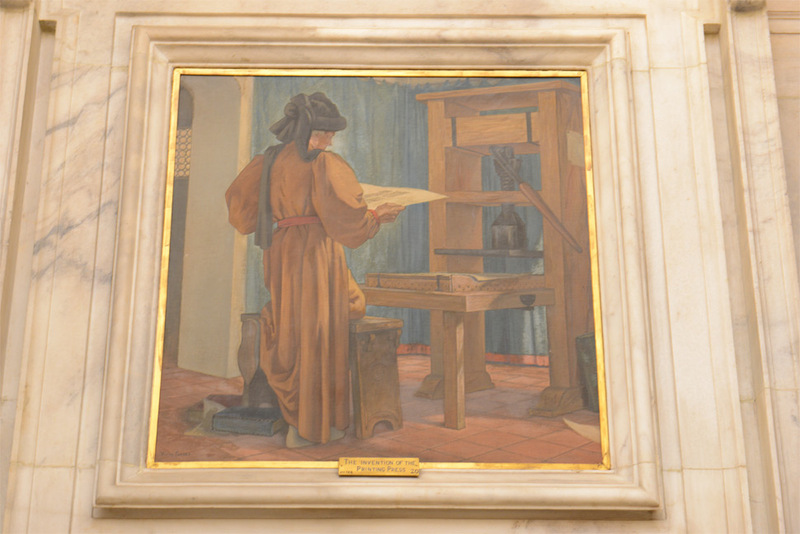 Invention of the Printing Press, on the other hand, was made by Vivian Forbes, and was commissioned around the same time as the previous painting. The painting represents William Caxton, an English merchant, writer and printer who introduced the printing press to England in 1476. The floor of the library has a round floral pattern made in white marble and golden yellow Jaisalmer stone. The design on the floor has at its centre a geometrical pattern. From the windows of the Library, one can also have a splendid view of India Gate. 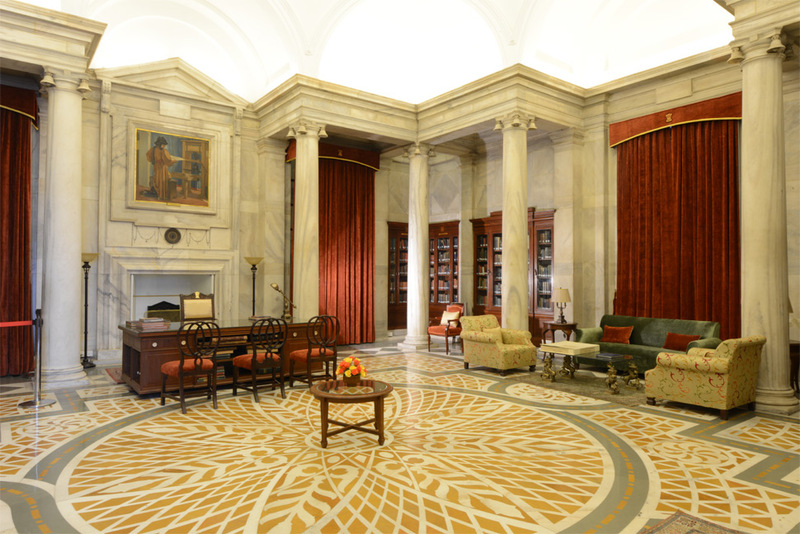 The audio-visual section of the Library of Rashtrapati Bhavan was inaugurated on June 13, 2013. The collection at Rashtrapati Bhavan includes archival materials collated from the All India Radio, Films Division and Doordarshan, all under one roof.